A Boulder, Colo., native and a 2012 UNC graduate in economics and global studies, Kenny Haisfield ’12 co-founded CEO4Teens in 2007. This organization “aims to create educational opportunities for financially disadvantaged teenagers and young adults around the world.” Their program in Indonesia has helped more than 100 teenagers continue their education beyond high school and into English and computer training. If you attended this fall’s 8th Annual Eve Carson Memorial 5k, then you know that Kenny was also actively involved in helping the chapter raise more than $120,000 for several philanthropic efforts. Through his apparel company, Kenny Flowers, Kenny offered a fundraising option to help boost this year’s results. We invite you to read his incredible story of an alum who does what he loves and loves what he does. Thanks, Kenny! What inspired the formation of CEO4Teens? A trip to visit my grandmother in Bali 10 years ago inspired the formation of CEO4Teens. As a high school student, I was very shocked that smart, driven young adults were unable to continue their education past high school. In 2007, my best friend and I asked friends, family and small businesses in our local community to make financial pledges for each hour of local community service completed so we could support those halfway around the world — those who had drive to create a better future for themselves, alleviate their families’ poverty and improve their communities. We thought it would be a one-time effort, but next year we will be sponsoring our 100th scholarship with money raised by Phi Delt's philanthropic efforts. 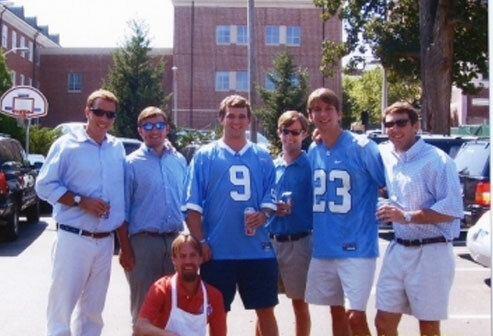 What inspired you to pledge Phi Delt at UNC? The house seemed fun, and I got along well with the guys I met during rush, already in the house and looking to join. Coming from Colorado, it was a great way to quickly connect with a good group of guys from different parts of the States (and world) and have a home base a bit larger than a college dorm room. What was the house like during your undergrad years? The house was a great place to call home. It had a good reputation for the right reasons, and I always loved its proximity to everything. And your interest in global travel and organization? How did you get involved in that? My interest in travel really began with a Euro trip before studying abroad in Madrid began. I loved staying in hostels, meeting cool people from all over the world and experiencing new places. I conducted a funded research project that addressed the economics of hostels in European markets during my last college summer and traveled across Central America and Europe for 100 days following graduation. Did you serve in any leadership capacity in the house or on campus? I continued my role as co-founder/president of CEO4Teens throughout college and was a VP/leader of UNC's ice hockey team. I studied abroad in Spain my junior year, which made it difficult to hold a leadership position in the house. While I did not have the opportunity to serve any leadership capacity in the house, I did enjoy working with Phi Delt leadership to partner CEO4Teens with the Eve Carson 5k. Any amusing stories you would like to share from your undergrad days? My mom helped me move in freshman year and dropped me off at my first Phi Delt party. Tell us about your professional journey since graduation. I've always had an entrepreneurial spirit and dream to start a business, but I didn't want to force it or give it a go at the wrong time. Upon graduation, I treated my three-year career at IBM as business school and loved my time as a young professional. I spent three years getting to think creatively, travel immensely, work with incredible people and don't have a regret in the world. I found ways to blend snowboarding, margaritas, family time, Latin American travels and more into the mix. One fateful evening in August 2014, on a Boston Harbor sunset boat party, the question was asked that started it all, "Man, you love your Hawaiian shirts so much. What if you made some?" In just a few minutes and a round of beers, the idea for Kenny Flowers was there. I realized there was definitely a need for a modern twist on the classic Hawaiian look. It was really hard for a guy (myself included) to find a fresh shirt that fits well, looks great and feels even better to wear. I saw an opportunity to address these needs and began to realize I could make this happen. Everyone I shared the idea with was on board and started telling their friends. I picked up the phone, called my Nana and asked if she needed a roommate in Bali. I knew Bali was right — a tropical island with rich village culture and vibrant beach scenes, radiating with creativity and, of course, my grandma. She could teach me a thing or two about how to run a business and live the life. I loved my life in the States — my friends, my job, my opportunities, but I left my corporate job in the city because the urge to explore and live an alternative lifestyle was too strong ... I thought, hawaiinot? In January, I felt it was the right time to apply everything I had learned in the corporate world towards something I'm truly passionate about and would love doing. 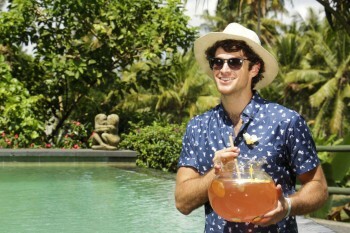 The money I had saved up to travel across South America became the money I would use to move to Bali and make the first few hundred shirts — later referred to as "The Hawaiinot Collection." What really inspired you to start Kenny Flowers? "Work hard, stay inspired, pursue your dreams, but always remember, it's not that tough to enjoy yourself along the way, no matter what you're doing." Whether at Carolina, IBM or traveling, this advice to myself always hit home. My love for Aloha shirts is deep rooted, stemming from the good times I had whenever I wore my dad's hand-me-down Tommy Bahama. Wherever life found me, from backpacking adventures abroad to my last semester of college and postgrad fun on both coasts, that faded pink beauty was there every step of the way. It always had my back and I always had a good time. This feeling of living life with half the buttons down was contagious and led to some of the best times of my life. I left my well-paying job at IBM and jumped halfway across the globe to start Kenny Flowers because I wanted to start sharing this feeling. My bloomin' remix of the classic Hawaiian hangs ready for the good times to be had and embody a reminder that if you keep things cool, classy enough and spiked with a little fun, you'll find your groove wherever you go. The first shirts were shipped out this May, and the response in the market has been inspiring. At first, I knew every customer but then it began to catch on. The shirts sold out and were instantly worn to rooftops, beach parties, city bars and even offices all over the States. They were wisped away with passports, taken on adventures from Cuba to Belgium and everywhere in between. The good times were blooming across the globe and continue to do so. My family has been incredibly supportive. My mom is the chief match-making officer for Kenny Flowers — connecting shirts with the right people since Spring '15. What inspired the interest to be part of the Eve Carson 5k event this year? Phi Delt has always done such a phenomenal job running the Eve Carson Memorial 5k for education, and CEO4Teens makes such a huge impact every year with the money raised to help financially disadvantaged teenagers continue their education. It just 100-percent felt right to keep a good thing going and make it better if possible. The event this year timed up perfectly with the plan to release the Carolina Bloom shirt — one ideal for game days, special occasions and every other time it's a GDTBATH (Great Day to be a Tar Heel). From the Kenny Flowers perspective, I wanted to sponsor the event in some capacity. Raising $10 per Carolina Bloom shirt sale made this possible as a young company. Most importantly, it's awesome for anyone who buys the shirt to know they're supporting education on the local, national and global level while having a good time. Do you stay in touch with any of your brothers? Yes, I've developed lasting friendships with many of my brothers and stay in close touch with a few best friends from my pledge class. I've been on the move so much since graduating, but it's always nice reuniting with my brothers around NYC, Chapel Hill or wherever. This past Memorial Day Weekend, I was in Los Angeles for work and ran into a few brothers at a bar. A little time in the States. I've been in Bali since July so I'm excited to see all my friends, family and customers. First stop was UNC Homecoming, followed by a week in NYC, Thanksgiving in Colorado and a few weeks in California. I take shirts around with me and have an online shop I can maintain from wherever. I encourage everyone to check out the site at www.kennyflowers.co (not .com) and use the UNCPDT free shipping code if you have some personal or gift shopping to do!